SOUTH BEND, Ind. 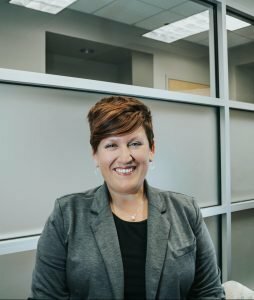 (October 15, 2018) — The South Bend – Elkhart Regional Partnership is pleased to welcome Bethany Hartley as its Director of Diversity and Inclusion, effective October 15th. In this newly developed role, Hartley will lead the South Bend – Elkhart regional efforts in executing strategies focused around developing more visibility, connection, mentorship, and business opportunities for women, minorities and immigrants that will ultimately lead to increased household incomes for the entire community. She will work directly with the Regional Partnership’s Diversity and Inclusion Committee to coordinate and implement key strategies and will serve as the primary point of contact. For the past decade, Bethany Hartley has served in leadership roles including director level positions at the Women’s Business Development Center (WBDC), a WBENC regional partner organization, in Chicago, and the Family & Children’s Center and Boys & Girls Clubs of St. Joseph County. Most recently, Bethany served as Deputy Director at RISE | Regional Innovation and Startup Education, where she also facilitated collegiate and high school entrepreneurship programs. The South Bend – Elkhart Regional Partnership is a collaboration of the economic development partners from 47 smart connected communities in Northern Indiana and Southwest Michigan. The Regional Partnership focuses on a long-term systemic approach to advance the region’s economy by aligning the efforts of various stakeholders around five key areas: Educating a world-class WORKFORCE, Recruiting and retaining great TALENT, Attracting and growing new economy companies in complement to our remarkably strong manufacturing INDUSTRIES, Promoting INCLUSION and sparking opportunities for minorities and Helping ENTREPRENEURS thrive. The Regional Partnership seeks to unify and collaborate so that together, the communities across the region to work together to achieve what cannot be done individually. For more information about the Regional Partnership, visit SouthBendElkhart.org.